With a bit of care, we can use them to elevate an idea to a new, more powerful level. They are one of the basic machines of the communication world. But unlike fulcrums, pulleys or wheels, analogies are built with the mind. As explainers, it’s our job to find new, compelling ways to elevate ideas. Finding the right analogy for a video has been a big part of our work at Common Craft since we started making explainer videos in 2007. In fact, once the search for an analogy begins, it becomes a mini-mission in our lives. Sachi and I brainstorm constantly over dinner prep, dog walks and downtime. We discuss strengths and weaknesses, refinements, and eventually define what’s likely to work for the video. And in the back of our minds is a reminder: analogies are never perfect. They simply set the stage for understanding. Why does my digital image look blurry when I make it big? Answering this question clearly was our challenge and we knew that an analogy would probably do the trick. But what is analogous to pixels? 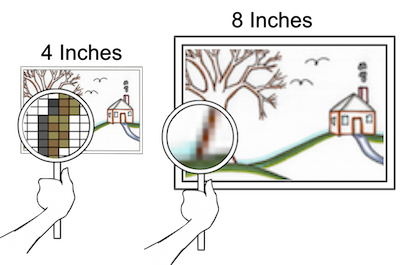 What’s like image resolution? Eventually we hit on something unconventional: blankets and yarn. Maybe, we thought, this could be our fulcrum. 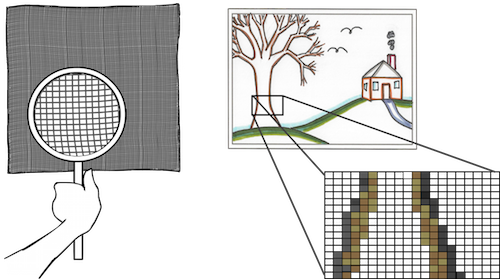 Could we compare a blanket to a digital image? The big idea is that a blanket is made with a specific amount of yarn and at a small size it’s a good, warm blanket. 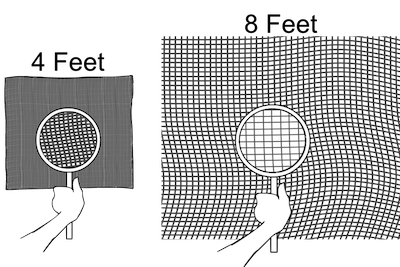 But if you stretch that blanket, the fibers separate and it becomes more like a net. The usefulness of the blanket depends on the amount of yarn used to make it. It’s familiar. Analogies work best when they are familiar. Everyone has seen and touched a blanket. The idea of stretching a blanket is easy to imagine. It’s concrete. Unlike the intangible pixel, yarn and blankets are real. If you needed to, you could demonstrate this analogy on stage. When analogies deal in concrete reality, they provide a more solid platform for understanding. By using an analogy, we can elevate a confusing topic like pixels and make it useful to more people.